I have not yet run git commit. Is there a way to undo this, so these files won't be included in the commit? There are 48 answers so far (some deleted). Please don't add a new one unless you have some new information. which will remove it from the current index (the "about to be committed" list) without changing anything else. without any file name to unstage all due changes. This can come in handy when there are too many files to be listed one by one in a reasonable amount of time. "git reset" (without options or parameters) used to error out when you do not have any commits in your history, but it now gives you an empty index (to match non-existent commit you are not even on). => Damn, I didn't want to add all of that. => fatal: Failed to resolve 'HEAD' as a valid ref. It further turns out that there's a bug logged against the unhelpfulness of this in the mailing list. And the solution indeed is to use git rm --cached FILE. --cached Use this option to unstage and remove paths only from the index. Working tree files, whether modified or not, will be left. to remove everything and start again. Didn't work though, because while add . is recursive, turns out rm needs -r to recurse. Sigh. I zipped up everything to a safe place before trusting git help rm about the --cached not destroying anything (and what if I misspelled it). I find git does a pretty good job of nudging me to do the right thing in situations like this. To clarify: git add moves changes from the current working directory to the staging area (index). So, which is the real undo of git add? Strictly speaking, and if I'm not mistaken: none. git add cannot be undone - safely, in general. If <file> was not previously tracked, git add adds it to the cache, with its current content. If <file> was already tracked, git add saves the current content (snapshot, version) to the cache. In GIT, this action is still called add, (not mere update it), because two different versions (snapshots) of a file are regarded as two different items: hence, we are indeed adding a new item to the cache, to be eventually commited later. The OP's scenario seems to be the first one (untracked file), we want the "undo" to remove the file (not just the current contents) from the tracked items. If this is the case, then it's ok to run git rm --cached <file>. And we could also run git reset HEAD <file>. This is in general preferable, because it works in both scenarios: it also does the undo when we wrongly added a version of an already tracked item. But there are two caveats. First: There is (as pointed out in the answer) only one scenario in which git reset HEAD doesn't work, but git rm --cached does: a new repository (no commits). But, really, this a practically irrelevant case. Second: Be aware that git reset HEAD can't magically recover the previously cached file contents, it just resyncs it from the HEAD. If our misguided git add overwrote a previous staged uncommitted version, we can't recover it. That's why, strictly speaking, we cannot undo [*]. Of course, this is not very critical if we just follow the usual lazy workflow of doing 'git add' only for adding new files (case 1), and we update new contents via the commit, git commit -a command. 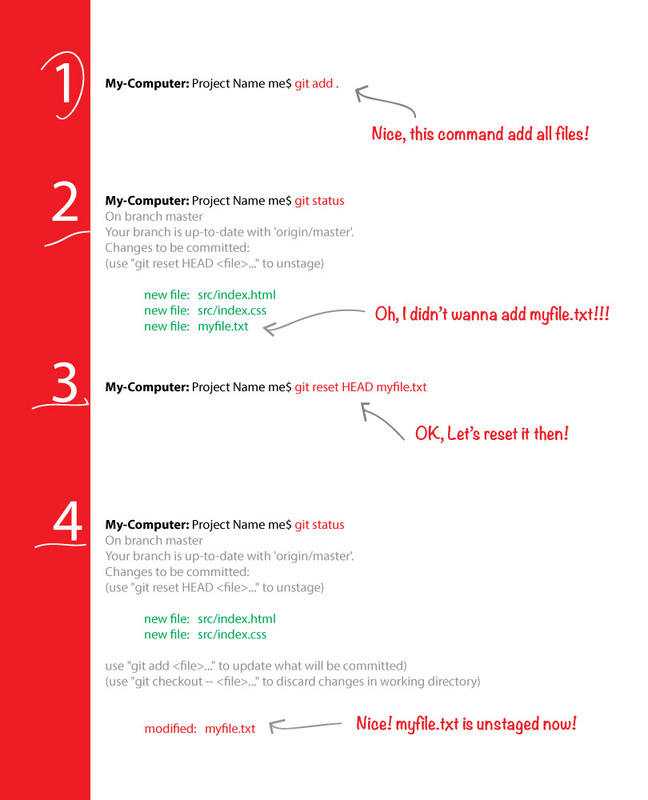 and remove all the files manually or by selecting all of them and clicking on the unstage from commit button. After you staged unwanted file(s), to undo, you can do git reset, Head is head of your file in local and the last parameter is the name of your file. Changed a file and used git add ., or git add <file>. This is needed since git reset --hard HEAD won't work with single files. adding a new file to the staging area, then undo with git rm --cached file. adding a modified file to the staging area, then undo with git reset HEAD file. Because it does the expected thing in both cases. Warning: if you do git rm --cached file on a file that was modified (a file that existed before in the repository), then the file will be removed on git commit! It will still exist in your file system, but if anybody else pulls your commit, the file will be deleted from their work tree. I found this great little post that actually adds the Git command (well an alias) for git unadd: see git unadd for details or..
note: foo is untracked now. Create the main directory for your new project. Now create a .gitignore file (even if it's empty). Git makes it really hard to do git reset if you don't have any commits. If you create a tiny initial commit just for the sake of having one, after that you can git add -A and git reset as many times as you want in order to get everything right. Check out that initial commit. This will remove all your files. Then check out your most recent commit again. This will retrieve fresh copies of your files, using your current line-ending settings. Maybe Git has evolved since you posted your question. This should be what you are looking for. fatal: ambiguous argument '<path_to_file>': unknown revision or path not in the working tree. Use rm --cached only for new files accidentally added. Just type git reset it will revert back and it is like you never typed git add . since your last commit. Make sure you have committed before. Suppose I create a new file newFile.txt. Note: checkout changes the code in the files and moves to the last updated (committed) state. reset doesn't change the codes; it just resets the header. to add parts of files. To choose a sequence just type 1-5 to take all from 1 to 5. Will remove a file named filename.txt from the current index, the "about to be committed" area, without changing anything else. git reset HEAD myfile.txt  # this will undo it. so, you will be in previous state. specified will be again in untracked list (previous state). In SourceTree you can do this easily via the gui. You can check which command sourcetree uses to unstage a file. SourceTree uses reset to unstage new files. 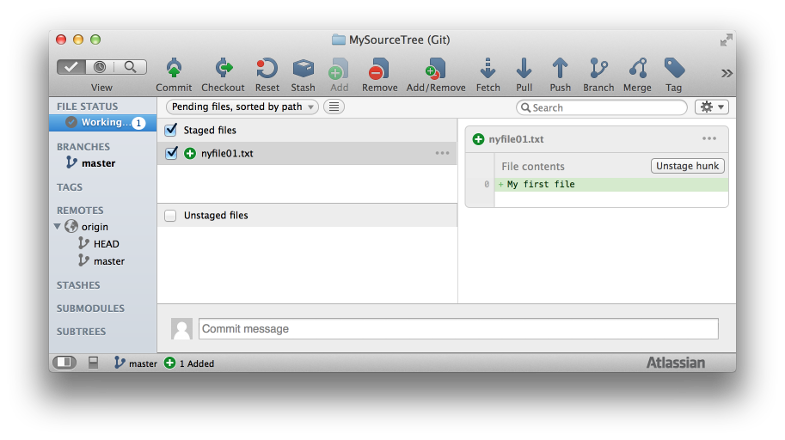 One of the most intuitive solutions is using SourceTree. Not the answer you're looking for? Browse other questions tagged git version-control git-commit git-stage or ask your own question. Remove all files for git commit? Why are there two ways to unstage a file in Git? How can you undo the last git add?